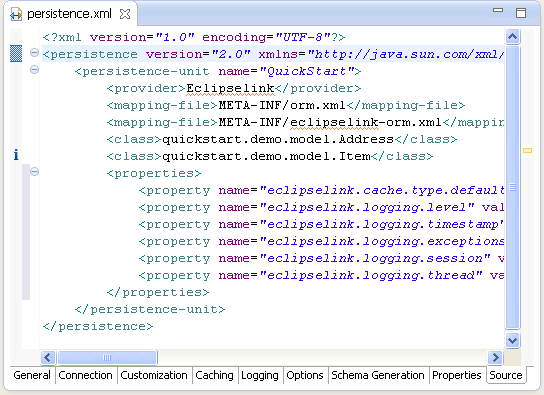 When you create a project, Eclipse creates the META-INF\persistence.xml file in the project's directory. You can manage this file either through the XML editor or through the persistence.xml Editor. General – Use this page to define the classes, mapping files, and JAR files for the persistence unit. Connection – Use this page to define the datasource (JTA and non-JTA elements) for the project. 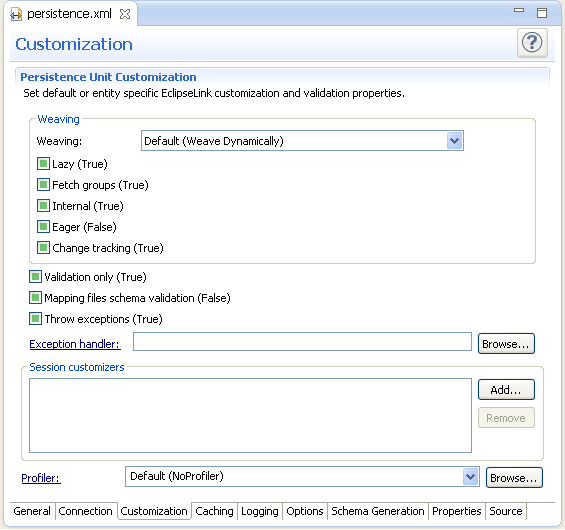 Customization – Use this page to define change-tracking and session customizer-related properties. 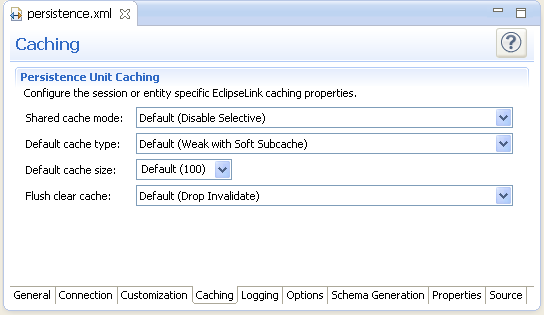 Caching – Use this page to define caching properties. 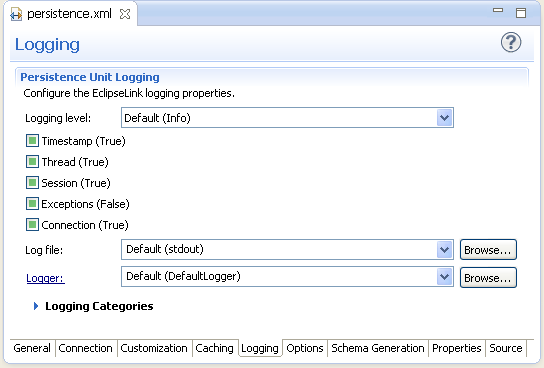 Logging – Use this page to define logging properties. 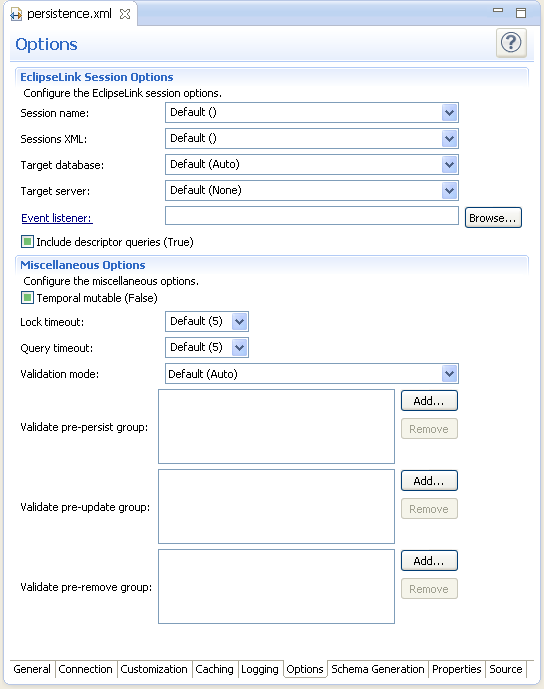 Options – Use this page to define session and target database properties. 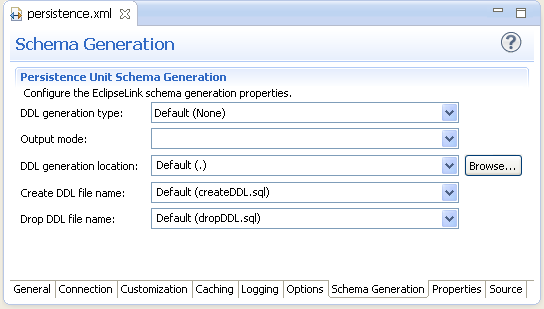 Schema Generation – Use this page to define DDL-related properties. Properties – Use to add or remove vender-specific properties. Source – Use to view or modify the XML source of the persistence.xml file. 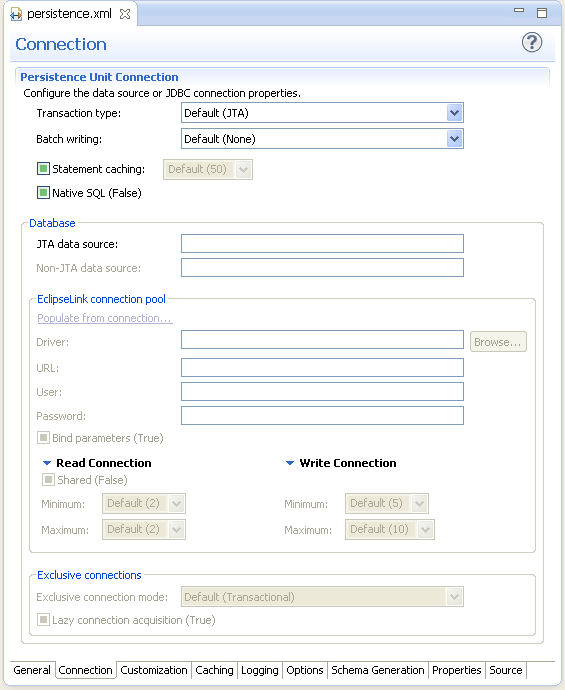 For projects using the EclipseLink JPA implementation, the Connections page also includes JDBC connection pool properties. If the project uses the Generic platform, then only the General, Connection, Properties and Source pages are available. Open the peristence.xml file. The General page of the editor appears. 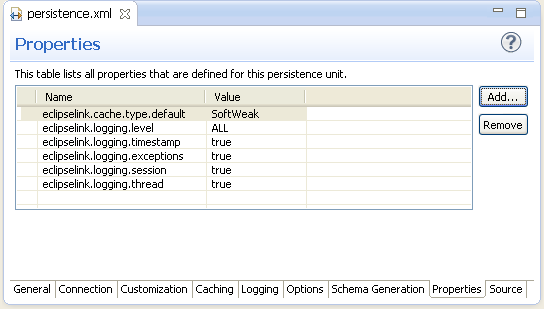 Use the General page to define the persistence.xml files <persistent-unit>-related attributes as well as the <provider>, and <class> elements (described in the following table). The persistence.xml Editor's Source page enables you to view and edit the raw XML file. Complete each field on the General page. Select JTA from the Transaction Type list. Enter the global JNDI name of the data source. Select Resource Local from the Transaction Type list. Select Default() to use the data source provided by the container. For projects using the Generic platform, you can also define the EclipseLink connection pool driver, connection pool driver, URL, user name and password. Complete each field on the Connection page. Use the table in the Properties page to set the vendor-specific <properties> element. Enter the <name> and <value> attributes for the <property> element using the table's Name and Value fields. To remove a <property> element, select a defined property in the table and then click Remove. 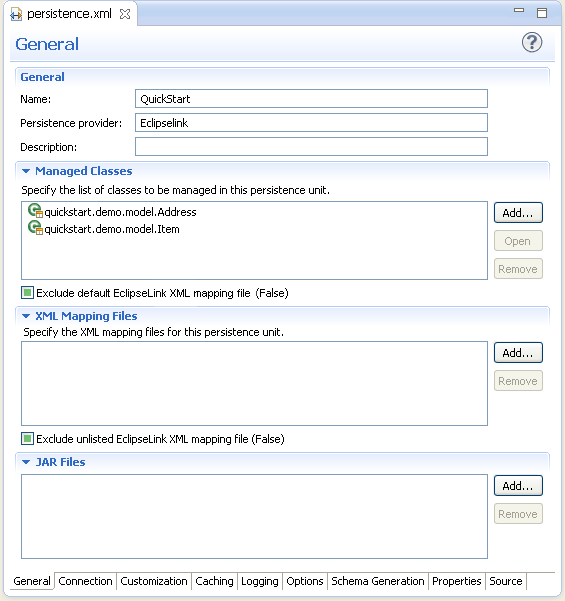 If the project uses the EclipseLink platform, the connection page also includes parameters for JDBC connection pooling. Complete each field on the Customization page. Additional pages may be available for the persistence.xml editor, depending on your JPA provider. See "persistence.xml Editor" for more information.